Home Secretary Theresa May has authorised a blanket ban on marches in Bradford on the day of a planned protest by a right-wing campaign group. 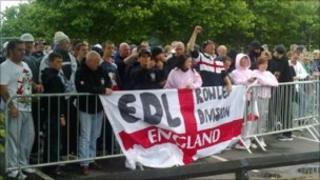 The English Defence League (EDL) had intended to demonstrate in Bradford on Saturday 28 August. Unite Against Fascism had planned a protest in the city on the same day. Despite the ban, groups can still hold "static" demonstrations. The move follows a high-profile campaign in Bradford to stop the planned EDL march. A 10,000-signature petition opposing it was handed to the Home Office earlier this month. The home secretary was asked to authorise the ban by Bradford Council which submitted a written application. It came after West Yorkshire Police's Chief Constable Sir Norman Bettison wrote to the council requesting an order to prohibit any public processions over the August Bank Holiday weekend. Guramit Singh, spokesman for the EDL, said he was "upset" and "angry" about the ban. He said the group had been working with the police towards a peaceful demonstration. He said the EDL would stage a static demonstration in Bradford instead. A statement from Unite Against Fascism said its planned "We are Bradford" event would be going ahead on Saturday at noon. It said the event aimed to bring together Bradford's communities in a peaceful show of anti-racist unity. A joint statement was issued by Tony Reeves, chief executive of Bradford Council and Assistant Chief Constable Mark Gilmore of West Yorkshire Police. It said: "Even though the home secretary has given her consent it does not prevent any static demonstrations taking place, which are still lawful provided they remain peaceful, as we have no legal powers to prevent them. "The police and the council have been working together closely for some time to plan for and manage any static demonstrations." They reassured the public the city would be "returned to normal very quickly" after any static demonstrations. A Home Office spokesman said: "Having carefully balanced rights to protest against the need to ensure local communities and property are protected, the home secretary gave her consent to a Bradford Council order banning any marches in the city over the bank holiday weekend. "West Yorkshire Police are committed to using their powers to ensure communities and property are protected and we encourage all local people to work with the police to ensure community cohesion is not undermined by public disorder." A spokesman for the Hope Not Hate campaign group welcomed the home secretary's ban. He said that if the EDL held a static protest, a peace vigil would be organised in Bradford city centre, to give people the "opportunity to show their opposition to the EDL and celebrate modern Bradford without fear of a confrontation". The EDL says it opposes "militant Islam" and describes itself as a "grass roots social movement who represent every walk of life, every race, every creed and every colour; from the working class to middle England".